Pond liner orders are shipped within 5 to 7 days. All in-stock items such as pond pumps and other pond or garden accessories are delivered within 24 hours for orders placed before 12 noon. GREEN = Zone 1 (Covers most of UK mainland) = £15.50 for the delivery of all pond liner orders and £9.70 for the shipping of all in-stock items such as pond pumps and other pond or garden accessories. DARK GREY = Zone 2 (Northern Ireland) = £45 for the delivery of all pond liner orders and £9.70 for the shipping of all in-stock items such as pond pumps and other pond or garden accessories. 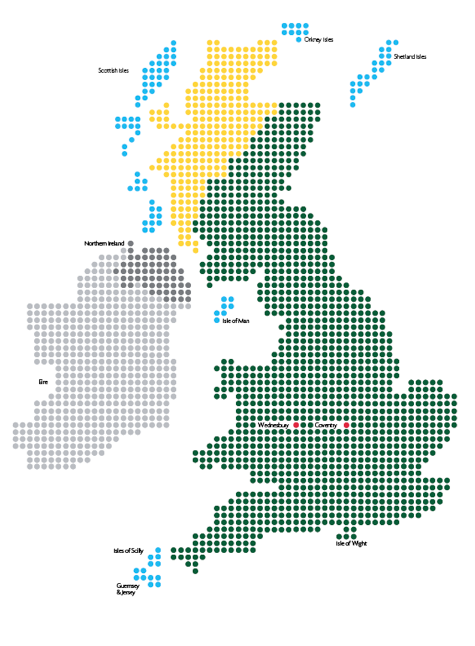 YELLOW = Zone 3 (Remote Scotland and Isle of Wight) = £65 for the delivery of all pond liner orders and £9.70 for the shipping of all in-stock items such as pond pumps and other pond or garden accessories. BLUE = Zone 4 (UK off-shore islands) = £125 for the delivery of all pond liner orders and £9.70 for the shipping of all in-stock items such as pond pumps and other pond or garden accessories.